Got the rear brake disassembled today to replace the brake cylinder. Unfortunately you need to take the whole lot off to do this. John Twist from University Motors does a good step-by-step of this, though repeating his steps on a wheel still attached to a car and whose parts are a tad rusty takes a bit more time. The anti-rattle springs (in the centre of Fig 1) are first to come off - though be careful as even old ones can shoot off suddenly when loosened. The springs are held on by a pin with a cross-piece at the top which fits through the washer on the spring and locks when turned 90 degrees. The bottom spring pulls off with a bit of effort, allowing the shoes to be pulled off the adjuster cylinder at the top and then off the brake cylinder at the bottom. 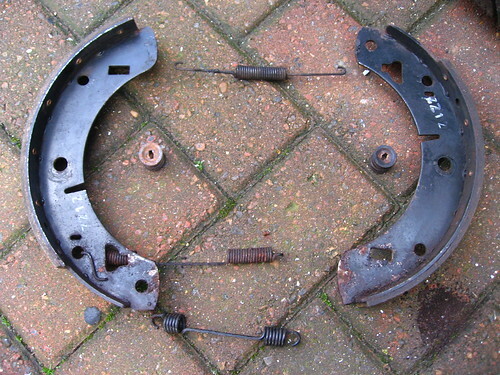 The rest of the assembly then comes off (Fig 2) with the shoes giving access to the brake cylinder. The cylinder itself (Fig 4) is held on with a circlip to the rear of the disc (Fig 3), though a good few years of dirt, grime and rust held ours on just as firmly and getting the circlip back on was probably the hardest part of the operation!